PLAY is an experiential installation conceived by artist Urs Fischer, with choreography by Madeline Hollander. 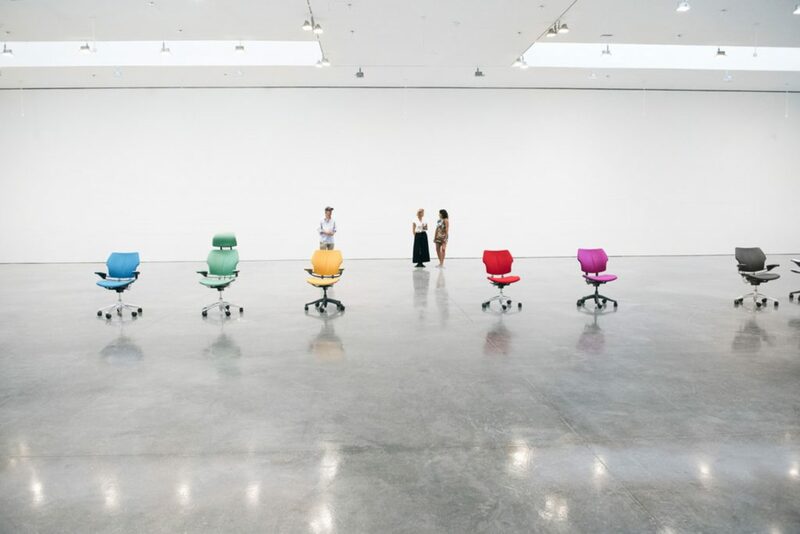 Designed to span sculpture, behaviour, and choreography, it encourages visitors to interact with nine office chairs that seem to have lives of their own. The two worked with a team of programmers and animators to create various gestures, movements and behaviour sequences for the chairs. Play is, of course, a ritual older than humanity, removed from reality and with no clear aims or values. It is a feedback loop of push/pull of energy and to echo this the chairs’ movements seem to suggest some level of predictability—only to then debunk the illusion. The more the viewer seeks to control the chairs, the clearer it becomes that they are not pawns or pets, but participants. PLAY is on view at Gagosian, West 21st Street, New York until October 13. 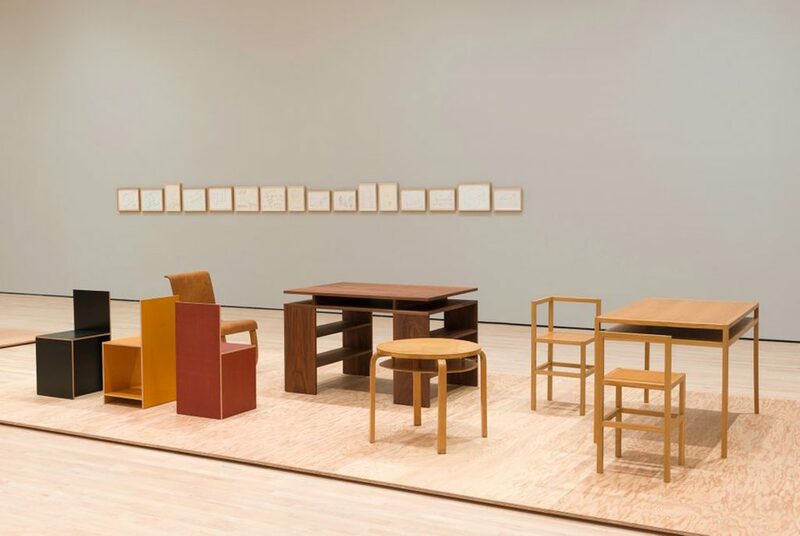 Specific Furniture is an exhibition at the San Francisco Museum of Modern Art to showcase the work of someone widely thought of as one of the most important American artists of the twentieth century – Donald Judd, an American, minimalist artist who died in 1994 aged 65. This exhibition — running until October 28 — looks beyond Judd’s work in sculpture, which he called “specific objects” to examine his furniture design. Judd’s designs emerged out of a need for functional, simple, and agreeable furniture and were developed in response to what he saw as an absence of good, available pieces. In addition to his roles as artist, designer, and critic, Judd was also a collector of furniture designs by Alvar Aalto, Ludwig Mies van der Rohe, Gerrit Rietveld, and Rudolph Schindler, among others. This presentation brings together Judd’s furniture designs with works that he owned and drew inspiration from, as well as a selection of Judd pieces that visitors can use outside the gallery. If you were lucky enough to have been in London this September, you might have caught the London Design Festival — an annual event now in its 16th year, which always features a diverse range of landmark installations and events spread across the capital. 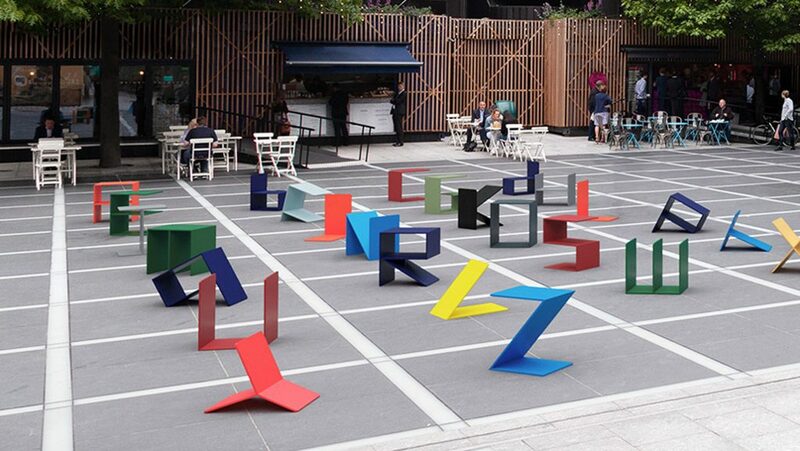 One of the many things worth seeing this year was Alphabet, a large-scale installation of furniture in the form of typeface in Finsbury Avenue Square created by London graphic design studio Kellenberger-White. Visitors were encouraged to explore, interact, move, and make words with the letters, which consisted of 26 colourful alphabet chairs made in folding metal inspired by Bauhaus Designers László Moholy-Nagy, Marianne Brandt and Wilhelm Wagenfeld. Other influences for this usable alphabet included Bruno Munari’s photos ‘Seeking Comfort in an Uncomfortable Chair’ (1944), Max Bill and Hans Gugelot’s Ulm Stool (1955), as well as Bruce McLean’s ‘pose’ works of the 1970s. Each chair was a different colour, chosen from a specialist paint manufacturer used for industrial metalwork – from International Orange (used for San Francisco’s Golden Gate Bridge) to Cornflower Blue (the colour of Middlesbrough’s Transporter Bridge). Kellenberger–White is a multidisciplinary studio, which focuses on identities, publications, exhibitions, wayfinding and digital platforms. It regularly collaborates with artists, curators, architects and designers, as well as with programmers, illustrators and photographer.